David Jones paints the Prince of Puke! "I love doing portraits of people I admire and respect. 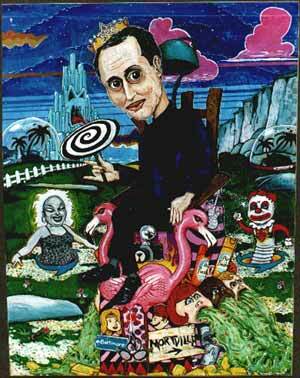 I wanted to try and create the definitive portrait of my fave cinematic terrorist John Waters - or at least come close. All of his fabulous films are represented as parts of the throne for the so-called 'Prince of Puke'. I've depicted him ruling over my personal interpretation of Dreamland - a slightly uglier but just as unreal version of the Land of Oz. John's throne is shown atop a trashed yellow brick road and he is wearing the crown of filth. I love the way his films stick their togues out at convention and blow raspberries at "civilised" society. Primarily, though, I think he's a great storyteller. His films always promise a story worth telling and it's always beatifully told. Wonderful characters (with great names!) great scenery and costumes and all created from a personal desire to just make a great entertaining movie everytime. I think alot of critics get the wrong end of the stick when they describe Waters' films as "juvenile". He just makes films for people who don't want to "grow up" or "settle down". I think it must be his own incapability to grow up which helps him make fun, uplifting,charming,cheeky, inspirational films again and again. He's a brilliant writer and goddammit he always seems like a lovely guy whenever he's interviewed! He should come and visit the UK sometime!"